You are currently browsing the category archive for the ‘Grouching the Oscars’ category. Oscar nominations are 15 hours away. It’s probably my favorite part of the whole Oscar season, even better than the ceremony itself. I don’t have a lot to champion this year. Unlike in 2011, my Richard-Linklater-directed favorite film of the year is firmly in the Oscar race. Many other favorites are nowhere near it. Some lower profile films that are right up my alley have high upside to appear in a number of categories, which means I don’t feel the need to hold my breath. Meanwhile, several contenders causing the largest bubble speculation – American Sniper and Cake – aren’t even available to the general moviegoing public yet. It seems to be a consensus pick to make it in, but I’m still holding my breath for The Boxtrolls in the Animated Feature category and I’d love for it to appear anywhere else (Song? Costume?). Whiplash will certainly pick up one nod for JK Simmons and an Adapted Screenplay nomination on top of that. Nightcrawler is vying for a number of categories. I’ll be rooting for them to show up as much as possible. Finally, they’re long, long, long shots, but hey, why not? Let’s hope for love anywhere for the likes of Snowpiercer, Calvary, Only Lovers Left Alive, or A Most Wanted Man. As usual, Jared and I have made predictions in the non-short categories – and he one-upped me by picking the shorts as well. Brian joins in for the big eight categories. When the nominations come out tomorrow, we’ll see who is the best Grouch. I think we differed a little more than often. I also felt like there were more categories than usual where I was agonizing over final picks due to a lack of good options. Is Robert Duvall really going to slide into the Supporting Actor field? As usual, areas where we differ are shaded in yellow. We did a terrible job making our picks this year. We swear we saw most of the movies! 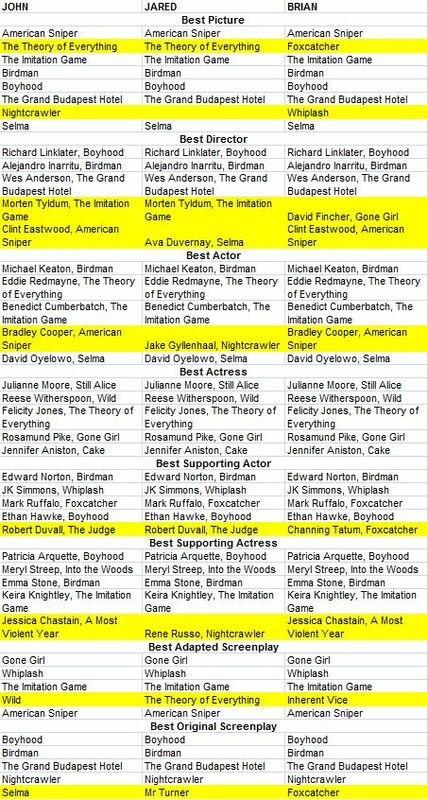 Here’s what we think should win in selected categories. Live Action Short Pitääkö Mun Kaikki Hoitaa? Nominations are a mere 15 hours away. As usual, Jared and I have made our predictions. Jared even tackled the shorts categories this year. Check back in tomorrow to see how we did. Instances where we differed in our selections are highlighted in yellow. With Oscar nominations just days away, I must admit this is a weird year for me. First, I feel somewhat less engaged than normal. The earlier nominations (they are announced two weeks earlier than they used to be) mean that I’ve seen fewer of the contenders. Perhaps I’m paying a bit less attention. Maybe I haven’t found anything to champion. But this year it’s not for a lack of good movies but because many of the ones I liked are getting plenty of awards chatter. But surely there will be a few things that would excite me on Thursday morning. 1) Let Oblivion get nominated for something. In particular I have M83’s fantastic score in mind. 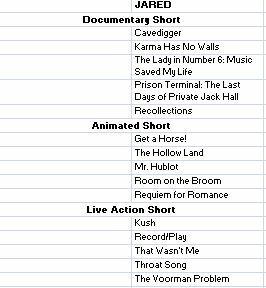 The film’s end credit song, naturally called “Oblivion,” is eligible in the Best Original Song category and would be a good choice in a year of lackluster choices. A nod in the Visual Effects category would be well-deserved too. In other words, I’m hoping for an Original Score nod but would take the others as consolation prizes. 2) I’m worried Inside Llewyn Davis is turning out to be the contender that will be just on the outside. 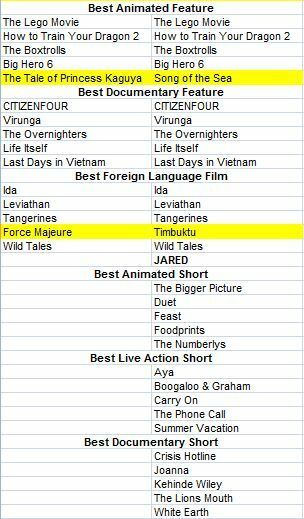 If anything is going to get edged out in some big categories (Picture, Director, Actor, Original Screenplay), this seems to be the one. It’s not a movie I immediately loved, but it’s sticking to my bones and that’s usually a sign of a film that I grow to love. I hope Oscar Isaac sneaks into the Best Actor lineup. 3) Some love for Enough Said would be wonderful. I was the Golden Grouch detractor on Nicole Holofcener’s last film, Please Give, but I was totally on board with this one. James Gandolfini has received due praise (though I can’t help but think his death is playing a role in that) but Julia Louis-Dreyfus is a revelation. It seems extremely doubtful that she’ll claim a nod but she’s at the top of my list so far. A Gandolfini Supporting Actor nomination or one for Holofcener’s Original Screenplay would be excellent. 4) I don’t think it’ll have much trouble getting them, but some craft nominations for The Great Gatsby would be nice to see. Production Design would be at the top of my list. 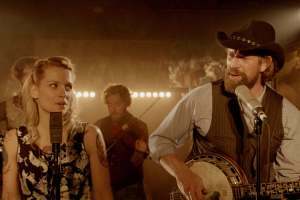 Meanwhile, the film contributes my favorite of the Best Song contenders, Lana Del Rey’s “Young and Beautiful,” which has the added benefit of having a killer placement in the film. “A Little Party Never Killed Nobody” from – gasp! – Fergie would also be a decent choice. 5) It’s not exactly a fair wish as I haven’t seen the other films on the shortlist, but I’m hoping for a Best Foreign Language nomination for The Broken Circle Breakdown. It doesn’t always work, but the parts that do pack some of the most powerful punches in 2013 cinema. So that’s my list. In two weeks when I’ve finally caught up with the likes of Fruitvale Station, Wolf of Wall Street, Her, and Nebraska I’ll probably have a lot more to add. I’ll look back at this prior version of myself who contentedly set his hopes low and pity him once I know better. But for now I’m an easy man to please. I’m going to compare 12 Years a Slave to another Oscar movie, but I don’t want you to read too much into it. I’m making the comparison for a specific reason and I’m the first to say the similarities are limited. But for me, the disagreements I’m having with people who really liked the film feel very reminiscent of the conversations I had about Crash. Now, don’t get me wrong, Crash has many many more faults than 12 Years a Slave. But Crash became a prestige movie due to its “exploration” of racism (along with the highly-regarded ensemble cast, etc.). The film offered a brutal lack of subtlety as it hammered home again and again the oh so controversial point that racism is bad. 12 Years a Slave isn’t anywhere near as silly, of course. The film, however, similarly hangs its hat on a single, extremely safe point: slavery is unimaginably awful. Director Steve McQueen has a knack for eliciting a raw, sparse, visceral feeling. Where Crash was overly slick, 12 Years a Slave feels more honest. Which is a designation I hate to use. But one I think is appropriate here, as McQueen never seems to use the camera for hyperbole or exaggeration. The events of Solomon Northrup’s enslavement are terrifying, and McQueen adroitly realizes his job is to cleanly show them. I think McQueen’s recognition for the film is well-deserved, and I wouldn’t argue against any nominations or awards he might receive. I’m going to rag on screenwriter John Ridley for a little bit. But before doing so, I want to make sure to note that he wrote a couple episodes of The Fresh Prince of Bel-Air, so no matter what, John Ridley is kinda awesome. The reason that Crash came to mind is that, for me, this movie does a good job reminding us that slavery was a horror and that being falsely enslaved is somehow even worse. Those notions alone, however, do not a compelling movie make. To Ridley’s credit, I should point out, that where Crash made me want to bang my head against a wall every minutes or so, the dialogue here is much cleaner and the story a million times less infuriating. The main character, Solomon Northrup is oddly bland. Chiwetel Ejiofor does a fine job with him, but the character isn’t particularly interesting. The supporting characters along the way are instead considerably more memorable. And largely one-note, to be honest, though having actors like Michael Fassbender, Benedict Cumberbatch, and Brad Pitt goes a long way toward making them compelling. I can maybe see an artistic argument for not counting off the twelve years, perhaps to show how the years ran together for Northrup or they felt like an eternity, or whatever. But, to me, Northrup’s time in slavery didn’t seem anywhere close to a dozen years, instead feeling more along the lines of three or four. Which, to me, suggests a weakness in the script’s ability to portray Northrup’s ordeal. And to me, that’s the problem. The script is content with saying, “boy, slavery sure sucked, huh?” And as it turns out, that’s enough to move some people. I was stuck on the relatively flat story. I wasn’t drawn in by the plot and did not feel particularly engaged with the characters. I think I would have had the same emotional response if someone spent two or three minutes giving me a middle school version of why slavery was bad. The emotional power of the topic of slavery is a double-edged sword. It immediately elicits an extremely strong response, and allows the creation of heroes and villains needing no special backstory. That emotion, however, can overwhelm the story, as it does here. I suppose if the goal of the film was to show how brutal the institution of slavery was, then sure, well done. But, to me, that’s insufficient. Illustrating slavery may be a noble goal, but the movie needs to tell a coherent, interesting story in the process, and it doesn’t. The Oscars are quickly approaching. Because we’ve spent the time to see the nominees and because we’re really smart (and I, at least, have impeccable taste), we’re telling you what should win in all the categories. I don’t get what people see in David O. Russell’s direction. I feel like the whole world has gone crazy. I mean, it wasn’t as bad here as in The Fighter, but that’s the lowest of bars. To his credit, he presumably had some role in coaxing great performances out of Lawrence and Cooper, and one of the first non-mailed in one from De Niro in ages. So there’s that. There’s lots of stuff going on in Beasts of the Southern Wild. And it is technically pretty impressive. So props to Benh Zeitlin for that, but when a ninety minute movie feels like it is twice that long, I’m going to dock the director, even taking the script into consideration. I found Amour mostly forgettable. It wasn’t quite as terrible as I was expecting, so tip of the hat to Michael Haneke for that. The film started out pretty strong. Opening up on the audience shot was fascinating. And I thought the scene with the running faucet was very well-executed. Life of Pi has some of the smallest scenes of Oscar contenders (much of the film takes place on a lifeboat, after all) but also some of the largest (the shipwreck, that crazy island). Ang Lee superbly executes this wide range of cinematic effort. When a book that many said was unfilmable ends up looking this great, you have to applaud the work of the director. 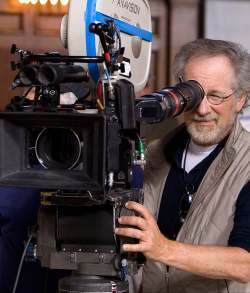 Lost in all the hubbub surrounding the omissions in this category is the fact that Steven Spielberg turns in another fantastic effort. He wrangles a massive cast of supporting characters while still always highlight the main one, creating a riveting movie out of a Congressional vote. I’m going through a number of scenes in my head at the moment, and they are all differently memorable and nearly perfectly shot. Should have been here: I’d keep Spielberg. Ben Affleck, Argo and Kathryn Bigelow, Zero Dark Thirty, obviously. And then I’d throw in Christopher Nolan, The Dark Knight Rises and Robert Zemeckis, Flight. The more I think about Silver Linings Playbook the more I dislike it and it is Russell’s project through and through. The tone is especially off. Meanwhile, those who love Amour likely do so based heavily on Haneke’s direction. But I was underwhelmed for the same reason. For me, it’s just too sparse. The other three movies have their directors’ fingerprints all over them. Isn’t the best adjective for Lincoln “Spielbergian?” Exquisite production elements, powerful John Williams score, and a lack of subtlety. Beasts of the Southern Wild and Life of Pi are more directors’ showcases. Zeitlin has such a neat vision for Beasts with the music, surrealism, and bayou shantytown grunge. It didn’t always work for me, but I love the vision and it probably doesn’t work at all without it. Indie film is full of gritty poverty realism and Zeitlin tries something with much more imagination. But Ang Lee is my winner. Life of Pi is all vision. Think of what goes into this film: spectacular visuals, spiritual and surreal elements, and long periods of time with one character alone at sea. This movie lives and dies on how it’s realized and Lee nails it. 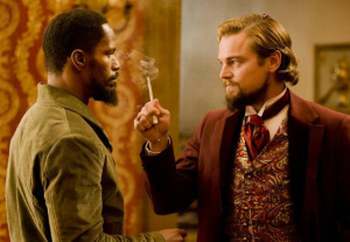 Should have been here: Speaking of directorial showcases, how about Django Unchained? This is Tarantino through and through (and is also a better movie than all those that were nominated). This is another tough category for me. It contains a number of films I admire but trying to pick the best writing achievement from them is a hard proposition. Amour is at the bottom of the pile for me. For those that love the movie, what do they love? The story? The dialogue? The character arcs? No, it’s probably the performances, the shot choices, the pace, and Haneke’s visual style. So vote for him for Best Director. The problem with Zero Dark Thirty is not torture, per se. All the political hand-wringing about whether it condones torture is overblown. I don’t think it has any duty to explicitly show the downsides of torture (though it is pretty explicit about its horrors). But I think it may have been a better movie if it had. I found the story to be distressingly linear. The key to finding Bin Laden gets discovered very early in the film and much of the rest of the story relentlessly follows that lead, overly simplifying a fascinatingly complex process. Yesterday, Jeff Wells published a response from someone connected to ZDT to yet another editorial about the film. He argues that the film does show the inefficiencies of torture and the years of false starts, but cites literally two lines of dialogue to back that up. I just think the film could have been richer; the film mostly left me with a desire to read a book on the subject to get a more complete view of it. One other script quibble I have is that the film diverts to show literally every major terror attack after 9/11, presumably to add some explosions to the film. Django Unchained is my favorite film in this category. My favorite film nominated in any category, in fact. Tarantino has made an immensely entertaining film, which is a compliment coming from me as someone who has never fully been on the Tarantino bandwagon. But while I enjoyed the story and the dialogue, all the other elements are what make it so great. The shots, the music, the visual flourishes. There’s no doubt Tarantino “authored” this movie’s success, but in the sense that I’d vote for him for Best Director. (Plus the story tends to meander a bit. People say he needs an editor to cut down on bloated runtime but I think he needs some help tightening up the scripts as well.) I could say the similar things about Moonrise Kingdom. Interesting characters and story but non-script elements make it special. This leaves Flight, which I think is the movie whose success is most fueled by its script. It takes a story about alcoholism in a creative and compelling direction. Whip Whitaker is a fantastic and complex character. The script also injects some levity into the story, keeping it from getting too bogged down in dreariness. Denzel Washington’s performance and a harrowingly-realized plane crash are other important elements, but a lot of the film’s success started on the page. Still, if I’m being honest, I’m rooting for Django or Moonrise so that one of them can win something. What should have been here? I really had high hopes for Looper and it’s a shame it didn’t make it. I get on Wes Anderson’s case a lot and I don’t regret any of it. However, his script with Roman Coppola for Moonrise Kingdom does have a lot of sweet moments. The quirkiness gets in the way of everything, but underneath is a touching story of first love and adolescence and being an adult and lots more interesting stuff. The events of Amour are…”mundane” might be the wrong word, but they are largely commonplace. Which isn’t necessarily an obstacle to making an engaging movie, but throughout Michael Haneke’s whole script I felt like I was watching someone’s home videos. I understand that’s an appealing quality for some people, but I didn’t see the point. The next three are among my favorite original screenplays of the year. Mark Boal’s script is part procedural and part action thriller. Perhaps unsurprisingly I prefer the latter. The first part of the movie is less remarkable, but it slowly builds to an epic climax. Boal seems really in his element writing tense war action, and maybe a little less confident in the investigation side of things. I still maintain that Quentin Tarantino would benefit from an editor of some sort to tighten up and slim down his films. But not too much, because there’s a lot of fantastic stuff in there. Tarantino has an absolutely wicked sense of comic relief, the scene with the hoods may be one of the funniest of the year. But like the gruesome shootout at the end (which may be one of the best showdowns of the year), I question how they fit into the movie as a whole. I was absolutely thrilled to see John Gatins get a nomination here. I thought he had two major roadblocks in his way: the fantastic crash sequence and the stellar work of Denzel Washington. Both of which, of course, stem from the fantastic screenplay. The story is well-plotted and the main character is fascinating. From hotel bed of sin to plane crash to hospital to farm to hearing, the film is always riveting, exquisitely paced, and thought-provoking. Should have been here: I’d keep Boal, Tarantino, and Gatins. 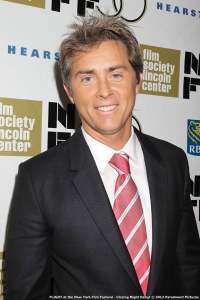 And I’d throw in David Wain and Ken Marino, Wanderlust and Seth MacFarlane, Alec Sulkin, and Wellesley Wild, Ted.